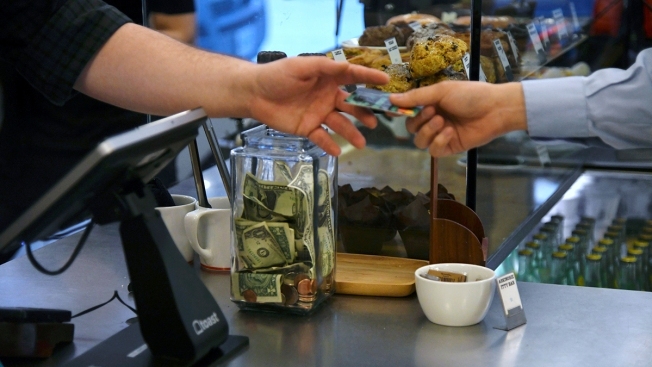 In this June 7, 2018, file photo, a customer gives their credit card to a cashier at a coffee shop in Chicago. "For Americans to benefit more from the expansion, real wage growth needs to be positive as it usually is in this phase of an expansion," said Robert Frick, a corporate economist with Navy Federal Credit Union. During the past year, higher prices for oil, gasoline and transportation have caused the inflation rate to jump after it had hovered at relatively low levels for the previous six years. The sudden increase in prices has not only wiped out average growth, but it also creates pressure for the Federal Reserve to hike short-term interest rates so that inflation stays close to the U.S. central bank's 2 percent target.